Mark has worked with Cork based guitar maker Harry McCormick in the development of a 13 stringed guitar. 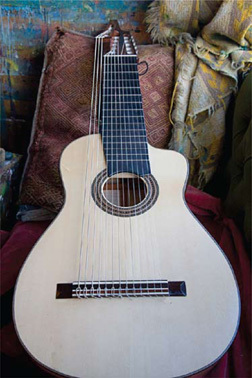 This instrument emulates characteristics of the baroque lute enabling guitarists to perform this music with minimal adaptation. Mark’s recording of "The Weiss Machine" Volume 1 released in 2015, features his arrangements of music by Sylvius Leopold Weiss (1687-1750) performed on the 13 string instrument. The CD is available to buy from this website. Check out the Youtube links opposite for performances by Mark Anthony on this unusual instrument. Further videos are available on the Youtube channel.